Empowering people in need of food, homes and hope. For over 30 years, Food and Shelter has been providing services that empower people in need of food, homes and hope. Imagine looking out your office window and seeing men, women and children pulling food out of your trash because they are starving. Imagine families with no place to call home and children who cannot enroll in school because they have no address. In 1983, these are the things that inspired our founders to find a solution to homelessness and hunger. Food and Shelter started as a once-per-week lunch for people who were homeless and has since grown to be a fully operational soup kitchen and shelter program. For over 30 years, Food and Shelter has been feeding women, children and men who are hungry and housing families in crisis. Food and Shelter are core components of our services and something we believe to be basic human rights of every individual in our community. We serve the most indigent residents of our community many of which live on little to no income. Our food program, funded by United Way of Norman, is second to none in Cleveland County. Hundreds of women, children and men rely on Food and Shelter for their daily nutrition. We serve breakfast and lunch 7 days per week to any person who is hungry. On average we serve 250 meals per day. In 2015 alone, we served over 100,000 meals. On top of this, we provide food baskets to hungry families who may have to choose between buying food and paying rent. Food is a necessity, not a privilege. The shelter component of Food and Shelter is a multi-faceted program. We provide short term, long-term and supportive housing for individuals and families who are homeless. We own and operate a transitional housing program where families with children can live for up to 2 years with the care and support of a case manager to empower and encourage them to build stronger, healthier families. 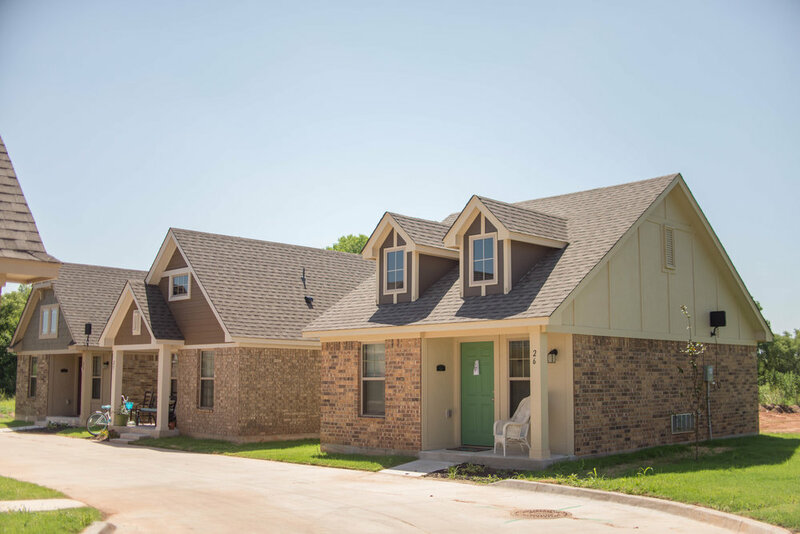 We provide housing for medically vulnerable, chronically homeless single individuals with the support of a case manager to ensure they maintain stable, healthy lifestyles. Because we do not have facilities for emergency shelter, we provide families who are homeless emergency placement through motel stays. Our prevention program is a new and unique strategy in tackling homelessness. By avoiding homelessness, we save our community money and reduce the trauma moms, dads and children experience with homelessness. We recently expanded our campus with a completely new kitchen and dining room, additional office space and 32 beautifully crafted homes for women, children and men who are experiencing homelessness. It is a dream come true. Our new location was completed in Summer 2017. You can see images of the project here.